VISIT THE HISTORICAL YEEDA STATION, a working cattle station in the Kimberley Region of Western Australia, located 160kms east of Broome. Yeeda encompasses the Fitzroy River mouth and vast coastal floodplains. Yeeda was settled in 1881 by the Murray Squatting Company that sailed to the north in a schooner from Pinjarra. It was first stocked with sheep then converted to cattle a few years later, which were more suited to the environment. The Yeeda floodplains are a convergence of several stock routes where cattle from the inland Kimberley were staged and either travelled south on the De Grey stock route or north into the Derby meatworks. Yeeda’s history is filled with stories of hardship due to floods, droughts and isolation. Yeeda Station is a working cattle station offering glamping accommodation and powered caravan/camping sites. Yeeda turn off located opposite Derby - Kununurra highway T-junction on Great Northern Hwy. The access road into Yeeda is 10km and unsealed. 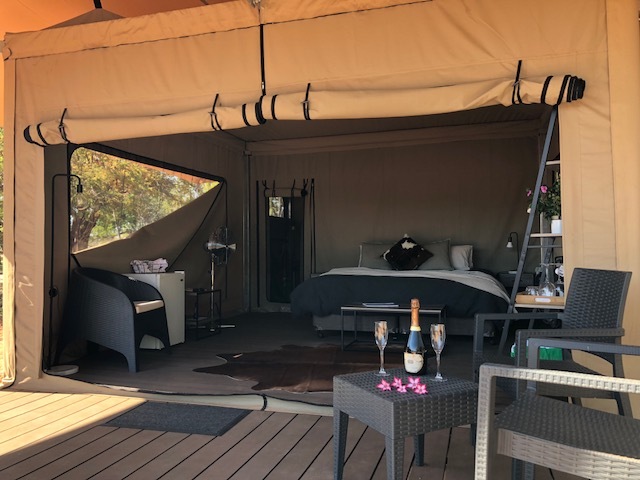 Glamorous glamping accommodation in spacious open plan en suited Eco Tents. Queen bed or twin available. Swags available for extra children. Meals are available at the Homestead by prior arrangement with the Managers (before 3pm). Continental or cooked breakfast available. CANCELLATIONS: For cancellations made within 7 days of your scheduled arrival you will be held financially responsible for your entire reservation unless Yeeda Kimberley Tours (Bungle Bungle) can fill the vacancy. Changes of reservation date or early departure are treated as cancellations and will carry the same fee. You are however always welcome to send a friend or a family member in your place. Because we are a small operator cancellations affect us significantly therefore we must abide by our policy in all circumstances. Note: Management reserves the right to re-assign sites/tents/seats under unforeseen circumstances.